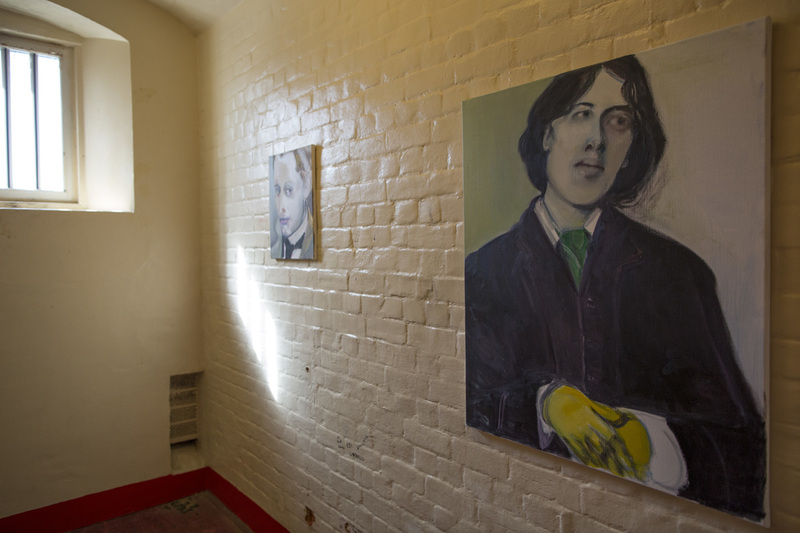 Reading Gaol, Where Oscar Wilde Was Imprisoned, Unlocks Its Gates For Art In 1895, Wilde was convicted of homosexual activity and sentenced to two years in prison. Built in the mid-1800s, the facility was operational until 2013. Now, it's hosting an unusual art exhibit. 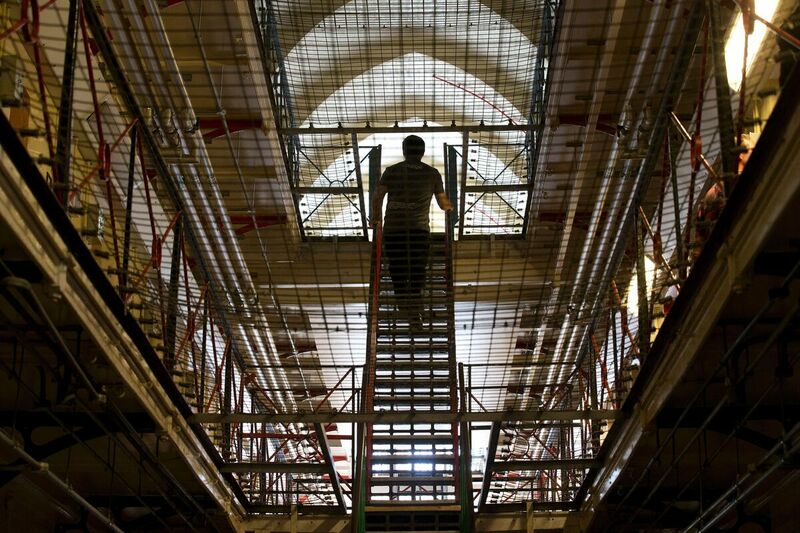 The Reading Prison was immortalized in Oscar Wilde's 1897 poem "The Ballad of Reading Gaol." Built in the mid 1800s, it remained operational until 2013. Beneath Gothic arches and metal walkways, a place of torment has been reclaimed as a place of creative ferment. In 1895, celebrated writer Oscar Wilde — author of The Importance of Being Earnest and The Picture of Dorian Gray -- was convicted of homosexual activity and sentenced to two years, most of which he spent in the infamous Reading Gaol. 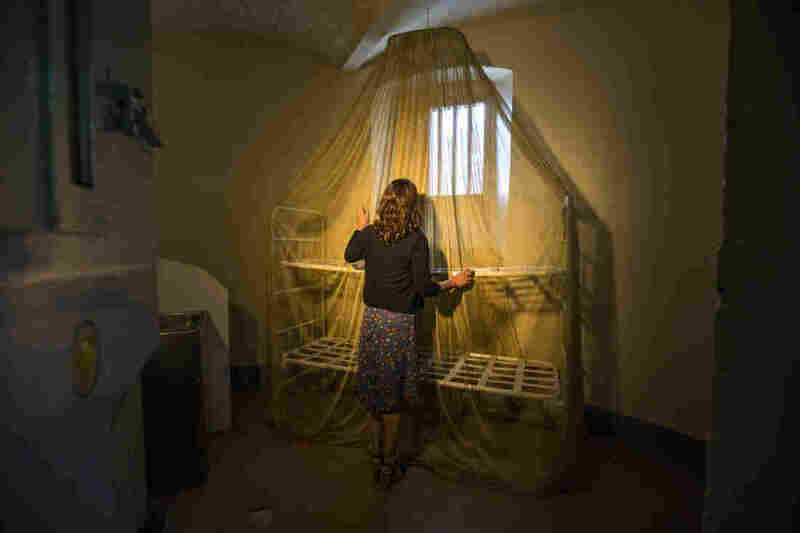 The British prison, which was operational until 2013, has just reopened for an unusual art exhibition; "Inside" features installations and texts inspired by the prison and Wilde's experiences there. Cells where solitary prisoners counted down the days are now filled with art. In one, artist and film director Steve McQueen has draped a gold-plated mosquito net over a bare metal bunk bed. In another, a river flows through the torso of a woman in a diorama by American sculptor Robert Gober. In another, Wilde and his lover, Lord Alfred Douglas, known as Bosie, are reunited in a diptych by Marlene Dumas. The organization behind it all is called Artangel — it specializes in bringing cutting-edge art into unused and unusual spaces. 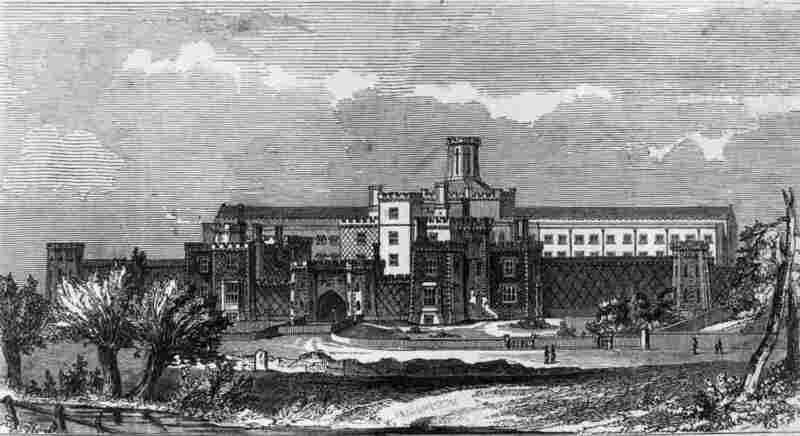 In the 1980s, nearly 100 years after Wilde was imprisoned in Reading Gaol, Gawain Davis spent three months in the prison for cannabis possession. Leaning over a display case of mug shots of Wilde's fellow prisoners, Davis observes: "They look like the same sort of people that I was back in here with, 100 years later!" A painting of Wilde hangs inside a cell at the former Reading Prison. In 1895, Wilde was convicted of homosexual activity and sentenced to serve two years. Like Wilde, Davis spent 23 hours a day in his cell. The only sanitation was a bucket he had to empty — or "slop out" — himself: "You were unlocked, let down for breakfast, locked back up again to eat it, unlocked again to slop out, to empty the bucket, then locked up again," Davis recalls. A miserable existence for sure, but Davis says Wilde had it worse — in Wilde's day, prisoners weren't even allowed to talk. When Wilde arrived, Reading Gaol was one great Victorian machine of Christian penance, forcing prisoners to meditate on their crimes in silence, while performing physical labor amid the reek of their own waste. The privations broke Wilde — but they also inspired his last work, "The Ballad of Reading Gaol," which was written after his release. In those two years behind bars, letters were all he was permitted to write. Several cells are filled with the sounds of "Letters of Separation," named after this form of imprisonment. In one cell, artist Ai Wei Wei is heard reading aloud a letter to his son about his imprisonment in China. In another, playwright Gillian Slovo addresses her dead mother, Ruth First, who was imprisoned and then assassinated under South Africa's Apartheid regime. All the letters honor the one that inspired them: Wilde's De Profundis — "from the depths" — the 50,000-word letter he wrote to Bosie, his lover and betrayer. Every Sunday, a different performer reads the entire 6-hour text aloud, in front of the original door to Wilde's cell. Artangel co-director James Lingwood says it wasn't hard to enlist an A-list cast of readers — including Ralph Fiennes, Ben Whishaw and Patti Smith; all they had to do was reach out to those who've cited Wilde as an influence. Wilde's cell door is exhibited in the prison chapel. Every Sunday, performers read De Profundis — Wilde's 50,000-word letter he wrote while incarcerated. "Almost without any exception they embraced the idea," Lingwood says. "Because when else would you get the chance to kind of come to terms and pay homage to Oscar Wilde within the very place where he wrote this compelling, extended love letter?" Lingwood has been struck by how much time visitors are spending at the exhibition. Jenny Welsh, a retired chaplain who's worked at other prisons, traveled 40 miles to visit the jail. She found that the artwork that evoked the isolation of imprisonment was particularly powerful for her. Her husband, Phillip Welsh, a retired clergyman, says the highlight for him was the renewed sense of connection with Wilde. "It was standing in his cell and looking out at the same window and seeing the same patch of sky that he wrote about," he says. Wilde's cell — number C.3.3. — is the only one without an original art work. In one corner, visitors have left some flowers. But in a sense, this entire exhibition is a floral offering to an artist seen as a martyr for loving, and living, in the wrong time, and the wrong place. Artangel co-director James Lingwood has been struck by how much time visitors are spending at the exhibition. This page has been updated to clarify two points. First, before spending most of his two-year prison sentence in Reading Gaol, Oscar Wilde was held in two other prisons for short periods of time. Also, his cell in Reading Gaol was C.3.3. Earlier, we referred to it as C33.